The longer days and warmer temperatures of spring invite us to leave our homes and get outdoors more. Unfortunately, it also invites scammers to get back to work. Spring and summer are big seasons for scammers who think nothing of taking advantage of unsuspecting people. As a provider of personal concierge services, we have had our fair share of experiences with scammers. We urge all of our clients to be on the alert for scammers now that spring has arrived. That includes being wary of people who offer concierge services. Our industry is certainly not immune. Summer is a popular time for door-to-door scams involving people posing as alarm installers, remodeling contractors, and utility workers. Door-to-door scams typically involve luring a homeowner outside while someone else enters the home from the rear. People lose all kinds of valuables to these kinds of scams. Experts say you should never accompany someone who has arrived at your house uninvited outside. Speak to any such person at the door and always ask for identification. If that person continues to insist that you come outside despite your objections, close the door, lock it, and call police. Contractor scams are especially offensive to us because they give businesses like My Divine Concierge a black eye. A typical contractor scam involves offering some sort of service in exchange for a cash deposit. Scammers insist they need the cash to purchase supplies before they can start work. The problem is that they walk away with the cash and never return to do the work. The best way to avoid these sorts of scams is to be suspicious. Insist on written estimates that detail every item you will be charged for. Demand references, then contact those references to verify the contractor is legitimate. And finally, do not ever put down a deposit. A contractor who needs a deposit is either scamming you or not very good at managing his/her own cash flow. Neither option is all that desirable. Next up are telephone scams. These take lots of forms, but two of the most popular right now involve tax returns and calls from people pretending to be police officers. 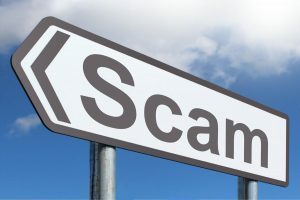 The tax scam usually begins with a call from someone posing as an IRS agent and threatening heavy fines and prison time for unpaid taxes. It includes demands that you send some sort of payment to avoid prosecution. As for the police officer scam, it works basically the same way. You are threatened with jail time for some alleged crime, jail time you can avoid by sending the scammer money. One last scam to be on the lookout for is the buyer/seller scam. This one takes advantage of people who buy and sell online. For example, let’s say you decide to sell something on Craigslist. A potential buyer might contact you and ask you to send the item in exchange for a money order that will be sent later. Don’t do it. These kinds of scams can almost always be avoided if you insist on meeting the buyer or seller in person and making the exchange in cash. It’s not foolproof but insisting on this sort of transaction weeds out all but the most bold scammers. And by the way, agreeing to meet at a police station almost always chases scammers away. In closing, we value our reputation here at My Divine Concierge. If you ever suspect someone representing our company is not being genuine with you, please contact us right away. We don’t want you to ever think you can’t trust us. We will do everything within our power to make sure you can.